The International Boundary and Water Commission, United States and Mexico, has reduced the release of floodwaters from Falcon Dam, located at Falcon Heights, Texas-Nueva Ciudad Guerrero, Tamaulipas from 30,000 cubic feet per second (860 cubic meters per second) to 27,000 cubic feet per second (760 cubic meters per second) on August 13 and will continue to reduce releases gradually over the weekend to match reservoir inflow, currently around 18,000 cubic feet per second (500 cubic meters per second), in order to maintain reservoir elevation near normal conservation capacity. Flows from the San Juan River, a Mexican tributary to the Rio Grande downstream from Falcon Dam, have also decreased due to reduced releases from Mexican reservoirs. With these reductions, diversions of water into the U.S. interior floodway at Anzalduas Dam in the Lower Rio Grande Valley will continue to decline in the coming days, thereby reducing water levels in the Banker Floodway, Main Floodway, North Floodway, and Arroyo Colorado in Hidalgo, Cameron, and Willacy Counties. 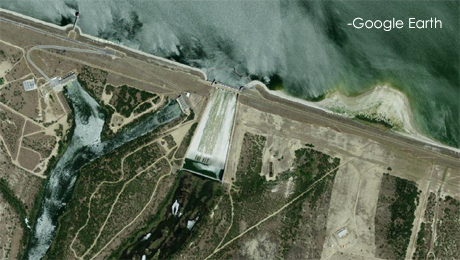 Release of floodwaters from Amistad Dam at Del Rio, Texas-Ciudad Acuña, Coahuila continues at the rate of 8500 cubic feet per second (240 cubic meters per second), the same level that has been maintained since July 21.